The Mortuary Haunted Mansion stands in a mysterious, restless beauty on Canal Street nestled between the Gates of Prayer Cemetery and the end of the Street Car Line. This haunted house is certainly the end of the line and your last stop for the best haunted house experience in New Orleans. On Saturday, September 17, 2016, at 6:30pm the doors to The Mortuary will open, inviting all who want to experience The Legend Of The Mortuary. You will see the unexplainable, and you will hear the sound of fear resonating through the walls as you work your way through a maze of chainsaws packing zombies, blood sucking vampires, and creepy clowns all stalking YOU! 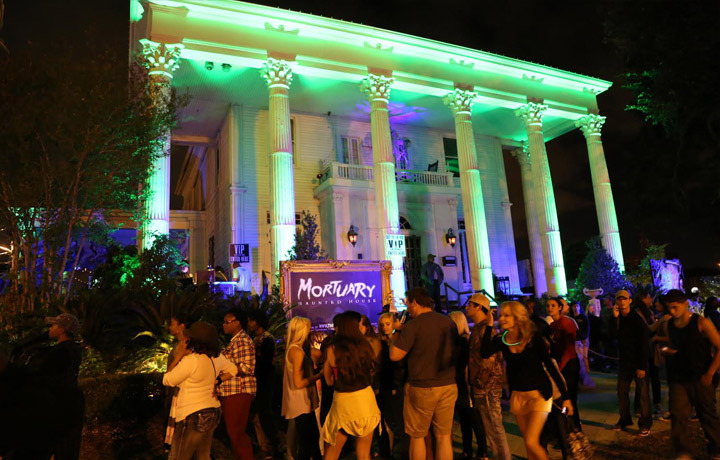 You do not wait in line at the Mortuary Haunted Mansion, you experience it. Zombies, Vampires, And Unknown Demons stalk around their eager, future victims toying with them and taunting them with their other-world features. Once you enter the mortuary and the door shuts behind you, a chill creeps up your spine. You will walk into rooms filled with an ominous fog and unidentifiable objects, then you’ll turn a corner just to be greeted by a creepy doctor covered in what appears to be blood holding a scalpel, then you may have a moment of peace before something new begins to approach you from behind. This is a haunted house unlike anything you have ever experienced. It is a sophisticated production filled with clever animatronics, professional actors, and a maze through an actual mortuary that will haunt every single one of your five senses. Don’t miss out on The Best Haunted House In New Orleans. You will love it…if you make it through!